Read the Miracle Grill Mat Reviews before purchasing. 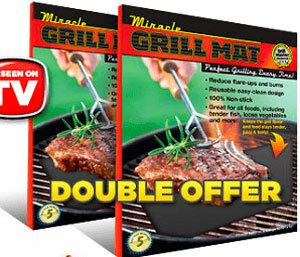 The Miracle Grill Mat was one of the first widely advertised BBQ grill mats, and first showed up as part of the “as seen on TV phenomena.” Most people had never heard of a BBQ grill mat prior to this massive television advertising campaign. For a short time, it became the most familiar barbecue product of its type in the world. It’s a clever name, too. Anything with the word “miracle” in it is an attention-grabber. Why do you think this post is titled “Miracle Grill Mat Reviews?” Because it gets your attention. Well, and also because that’s what it is. Anyway, let’s take a closer look at how this As-Seen-On-TV thing works, since that’s the source of everyone’s familiarity with this product. All Miracle Grill Mat reviews should take a close look at the history behind this phenomena. 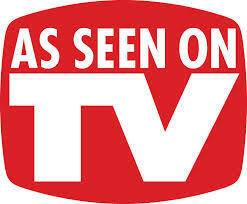 Generally, infomercial items are produced on a very tight profit margin and they depend on a high volume of sales. When sales are aggressive in that way, every penny that can be saved in manufacturing can result in a significant increase in revenue. Consequently, the temptation to cut costs is always present, and it’s a temptation to which many companies succumb. 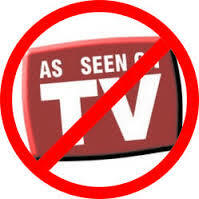 As a result, the as-seen-on-TV deals are not always the best available when you consider all the issues – quality, for example. I found that to be the case with the Miracle Grill Mat, and I’ll explain why. This isn’t information you’ll find in other Miracle Grill Mat reviews. When the grilling mats first became available on television, there was literally no other place you could purchase them. Due to the initial popularity of the mats, competition began to spring up very quickly. Grill mats began popping up under a large variety of brand names, as other marketers attempted to get a free ride on all that television exposure. 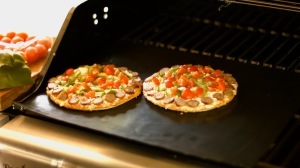 Consequently, you can now find over two hundred companies selling their own version of the barbecue grill mat online. This predictable surge of imitation produced contrasting outcomes. First of all, it resulted in many cheap imitations from first-time online sellers who were simply attempting to make a quick profit (can you blame them?) Many of these companies actually sell their grill mats under the name of Miracle Mat or use the term “miracle” in their loglines or advertising. They use the As-Seen-on-TV logo and Miracle Grill Mat Reviews to market their product, even though it is not the original product at all. Conversely, it also resulted in companies that were interested in building a long-term, customer-based businesses. These companies set out to refine and improve the grill mat concept, and to create features and specifications that went beyond what the original Miracle Mat offered. Many of the newly available grill mats that are referred to as “knock-offs” are actually of a higher quality than the original Miracle Grill Mat. You can see those side by side comparisons in many of the miracle grill mat reviews that do detailed product comparisons. You’ll find that there are many grill mats now available that are thicker, larger and have a lower friction co-efficient than the Miracle Grill Mats. This really shouldn’t come as a surprise to anyone. Despite its shortcomings, the As Seen on TV business model unintentionally supplies a very valuable service to the development of higher-quality products. For example, when the Miracle Grill Mat hit the market, it was subsequently used and tested by tens of thousands of barbecue fans. Many of these users posted comments, detailing the shortcomings of the product and providing clues on how to improve it. Naturally, there are many positive comments, but it is the negative ones that provide the important information. Let’s take a look at a few of the Miracle Grill Mat reviews posted on Amazon by verified purchasers of the product. I bought this grill mat because the video made it look like a great item. However I was extremely disappointed because It is not nonstick. I used it over charcoal and it burned the food and could not remove the crust burned on the mat. Not able to use again because it will not come clean. Absolutely nothing as advertised. THESE ARE CRAP. THEY WILL BURN UP IF YOU DON’T WIPE GREASE UP WITH TOWEL AND LEAVE GRILL LID OPEN. DON’T GET SUCKERED IN!!!!!!!!!!!!!!!!!!!!!!!!!!!!!!!!!!!! There are many more miracle grill mat reviews similar to these, but you get the idea. Based on comments such as these, a few manufacturers went to work, collecting information from users and redesigning the grill mat. The result went both ways: It produced a lot of very cheap imitations of the Miracle Grill Mat and a few greatly improved versions such as those created by Kona and Chef Caron. When a manufacture is proud of a product feature, they point it out in the product description on the sales page. Otherwise, they don’t mention it. You’ll notice the conspicuous absence of specifications on almost all the grill mats currently for sale, including the Miracle Grill Mat. 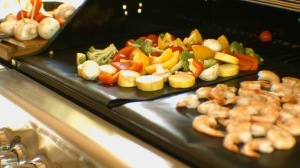 They make generalized claims, such as “Best Grill Mat” or “Highest Quality Grill Mat” but they don’t give you the particulars such as the thickness in millimeters of the mat, the individual weight, or the volume of PTFE (the nonstick material). These are the features that define quality in a mat. The three most important improvements on the BBQ grill mat are the size of the mat, the thickness, and the amount of PTFE, which is the nonstick material that covers the grill mat. Uppermost among these improvements is the PTFE coating. This is what binds the mat together and defines the durability of the grill mat. It also defines the coefficient of friction, or the slickness of the mat. This is an important factor in the ease of use and food management as well as ease of cleanup. These factors are particularly important in a commercial settings or professional kitchens. If you’re able to compare different mats side by side, which I have done, you can visibly see the difference in PTFE coating. On cheaper mats, like the Miracle Grill Mat, the fiberglass textures are clearly visible. They create a roughness on the surface of the grill mat that catches micro-particles of the grilling food making the food more difficult to manage and creating problems with cleanup with sticky foods. The dimensions of a mat have little to do with it’s quality, but a lot to do with how convenient it is to use. In the early days of the Miracle Grill Mat the standard mat dimensions were around 13 x 15 inches. That’s the size of a Miracle Mat. Some of the newer mats have added a couple inches and it makes a significant difference. Two 13 x 17 inch grill mats will cover the entire grate nicely and give room for a comfortable workflow, leaving some space to move the food around. Thirteen inches is a bit small for convenient food management. At this point it won’t surprise you when I suggest you skip the Miracle Grill Mat altogether, and go for one of the greatly improved mats. You’ve probably gotten the impression that I wasn’t impressed with the Miracle Mat. That’s accurate. Of all the mats I tested it wasn’t the worst, but it was far from the best. When shopping for a BBQ grill mat I suggest you take advantage of the improvements that were made in the last year or two. Look for a grill mat with a thickness of .25mm, an extra-large size, extra layers of PTFE, and an instruction manual on how to use the mat. Believe it or not, most complaints about BBQ grill mats stem from incorrect use: applying too much heat, using metal tools, overloading the grill, cooking foods on them that produce excessive amounts of grease, and cleaning them improperly.